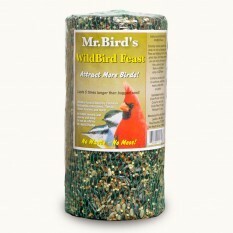 A 28oz dual purpose seed block, hang in the provided net or mount on the Mr.Bird's EZFeeder shown on this website. Large size means this block will last for days and days, no more running out to refill the feeders constantly. What makes this product special is the formula; PECANS, black-oil sunflower, sunflower hearts, and just a dash of white millet. You will see the quality and the dramatic results in your own yard. An amazing variety of birds visit the WildBird Feast. In addition to the regular feeder birds such as; Cardinals, chickadees, woodpeckers, nuthatches, finches, and titmice, we have reports of various warblers, wrens, kinglets, mockingbirds, and even bluebirds eating these NutCakes. No waste, no mess, never melt.